There is a little old temple called Sengakuji near Shinagawa in Tokyo, close to Tokyo Bay, on the south eastern side of the city, traditionally considered one of the less auspicious directions. Many years ago I lived just outside its gates. Beside it there is a graveyard housing forty seven stones. They are always freshly scrubbed, with sprigs of fresh pine and flowers laid on top and sticks of incense in front sending up scented smoke. On December 14th every year the street is lined with lanterns and the temple grounds are packed with people and food stalls. Everyone makes sure to visit the small graveyard, to put their hands together and pay their respects in front of the stones. It all began 316 years ago, in 1701, when Lord Asano, the 34-year-old lord of the province of Ako, near modern day Kobe, was in Edo, now Tokyo. In those days every daimyo lord had to go every alternate year to pay homage to the shogun. 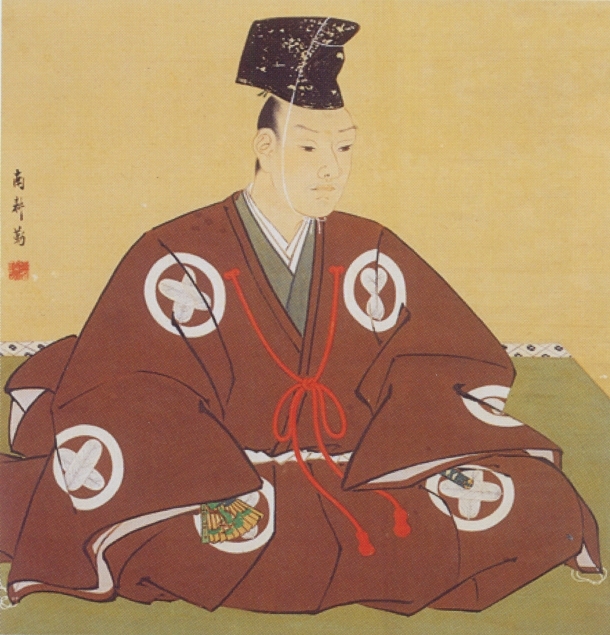 The fifth shogun, Tokugawa Tsunayoshi, was ruling at the time. Rather like the earls and lords in Queen Elizabeth I’s time, the various lords had positions at court. Lord Asano had been appointed to host the emissaries who came to visit the shogun from the Emperor’s court in Koto. He was young and inexperienced, so Lord Kira, the highest-ranking master of protocol at the shogunate, was assigned to instruct him. Lord Kira was a difficult, arrogant man and expected deference and payment. That year emissaries were expected from the imperial court on April 21. Lord Kira was giving Lord Asano instruction in the Corridor of the Pines at Edo Castle, but his behaviour grew more and more contemptuous and insulting. Eventually the young man, goaded beyond endurance, drew his sword and took a swing at him. He barely scratched Lord Kira’s face. 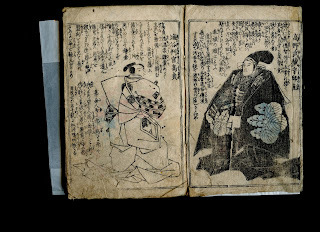 But to draw one’s sword in Edo Castle, let alone attack an official, was a capital offence and Lord Asano was ordered to commit seppuku - to kill himself immediately by honourable suicide. Then he committed suicide in the prescribed manner. His lands and estate were confiscated and his heir was disinherited. He was buried in Sengakuji Temple. When the news reached his province there was uproar. 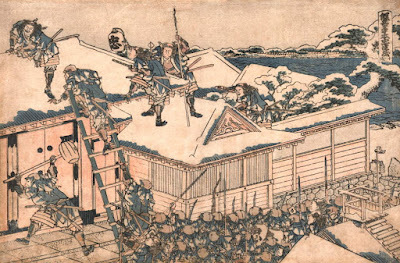 At a stroke all his men - over 300 of them - had been condemned to be ronin - ‘wave men,’ samurai without a master, at the mercy of the wind and waves. As in Anglo Saxon England, to be a warrior without a lord was to be cast out, outside the safety and security of the castle walls, into the wilderness where the waves beat against the shore. Thrown out of the castle the men dispersed. Some took menial jobs. They became tradesmen or carpenters or craftsmen or monks. Others abandoned their samurai lifestyle altogether and gave themselves over to drink and dissipation. Most shocking of all was a man called Oishi Kuranosuke, who had been Lord Asano’s chief retainer and a famous warrior. As if he had no principles at all, he left his wife and moved to the capital, Edo, where he started hanging out in houses of ill repute, drinking and carousing with prostitutes. He was regularly spotted staggering around, engaging in drunken brawls. Once a samurai from another clan, finding him lying drunk on the street, spat on his face and shouted at him that he was unworthy to call himself a samurai. The arrogant Lord Kira, who had been the cause of the whole calamity, had been expecting that Lord Asano’s men would be plotting some sort of revenge. His spies kept a close eye on them - but by now nearly two years had passed and it seemed they really had gone to the dogs. Little by little he relaxed his guard. And so the 14th day of the 12th month of the 15th year of Genroku - 1703 - dawned. 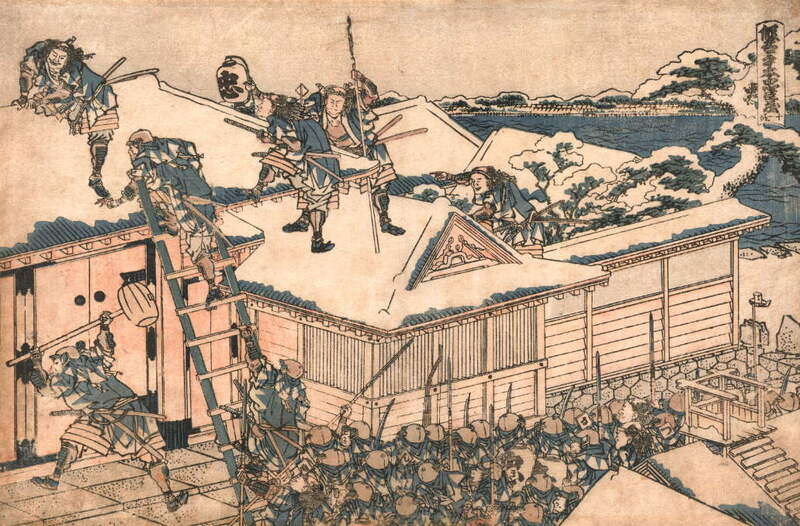 It was midwinter and snow lay thick on the ground when 47 of the ronin, ranging in age from fifteen to seventy-seven, assembled. At their head was Oishi Kuranosuke. They had spent the last years play acting to put Lord Kira off the scent - and they had succeeded. 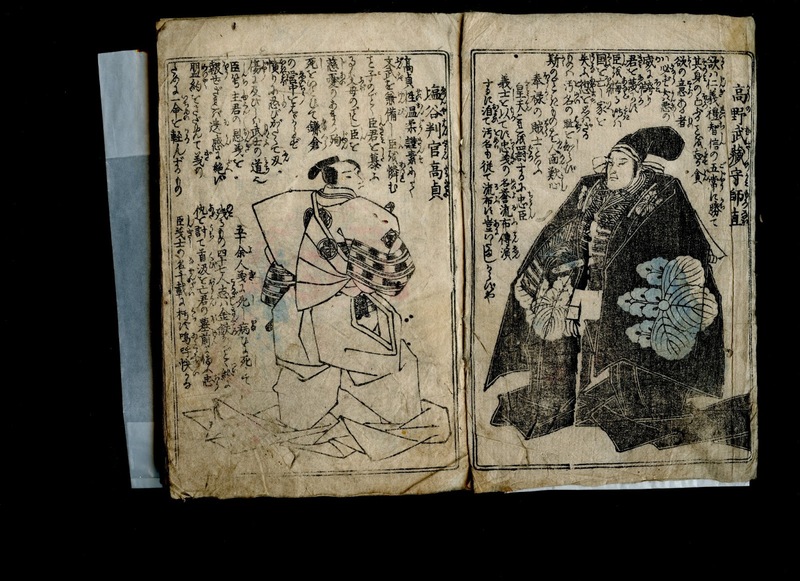 They’d hidden caches of weapons and armour and Oishi had explained his plan to his wife and divorced her so that she would not have to share his punishment for what he was about to do. The 47 divided into two groups and stormed Lord Kira’s mansion. One group entered through the rear of the compound while the rest forced their way through the front, battering the gate down with a mallet. Lord Kira, hearing the hullabaloo, sneaked away and hid ignominiously in an outhouse toilet. Searching for him, the retainers stabbed spears through the walls until one came out with blood on the tip. 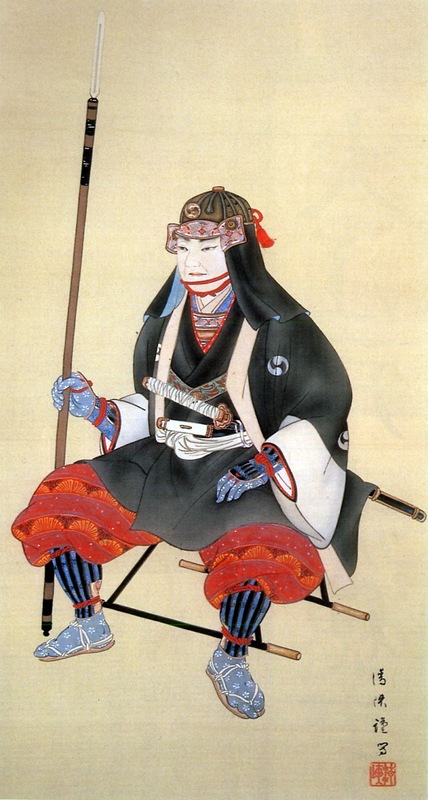 They hauled him out and killed him with the same short sword with which Lord Asano had been ordered to kill himself. Then they cut off his head, stuffed it into a bucket and marched through the streets to Sengakuji Temple, where they washed it in the spring on the hillside and placed it before the tomb of their dead lord. Their revenge complete, they turned themselves in. The men had lived up to the standards of loyalty expected of true samurai. In the eyes of the populace they were heroes. 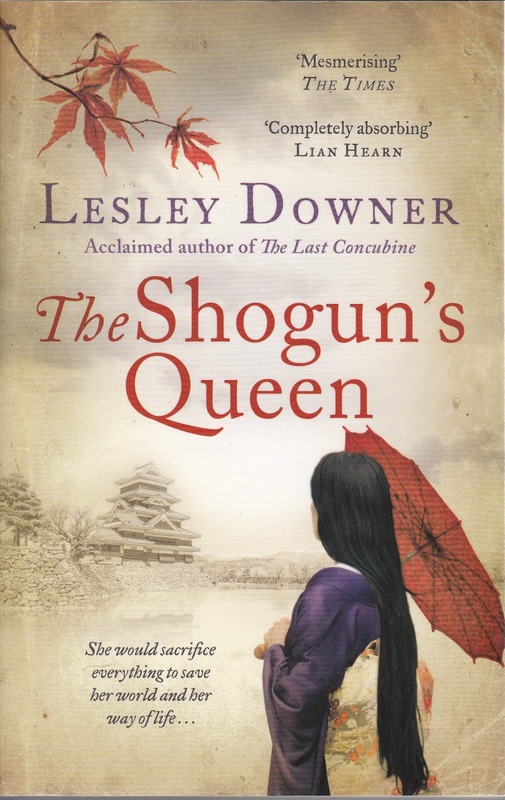 Nevertheless, they had broken the law and, despite his sympathy, the shogun was obliged to sentence all forty seven to die by their own hands. People crowded the streets to applaud, awed by their dedication and sense of samurai honour, as their bodies were carried to Sengakuji Temple to be buried alongside their lord. To this day the 47 are popular heroes, and their story is told again and again. It’s a favourite theme for kabuki and Japanese movies. And anyone that is moved by the romance of Japanese history will want to make a pilgrimage to Sengakuji to place sprigs of fresh pine on their graves and put their hands together in respect - most particularly today, December 14th. That was an awesome telling! Agreed! What a fantastic story! Has it all. Lesley, what a wonderful if heart-breaking story of their loyalty and dedication. Thank you! Thank you, all of you! To me it's a very moving story.